Stand out as the supplier of choice by demonstrating the cyber security measures you have in place. Make it easy to find the level of security measures in place and enable your organisation to stand out from the competition. Cyber security compliance then becomes another marketing tool rather than another task. Displaying the level of security measures you have in place on your website can enhance your position as a trusted supplier. Implementing the government backed Cyber Essentials or Cyber Essentials Plus, ISO 27001:2013, PCI DSS Compliance and having regular penetration tests (or a combination of these) makes it easier for potential customers to see you as a trusted supplier. This is even more important when breaches such as the Typeform breach in July 2018, can affect multiple data controllers. In this particular case Travelodge, Fortnum and Mason, the Liberal Party, and Monzo were among some of the organisations affected. To demonstrate due diligence on the security measures in place, data controllers have been asking many of their processors to complete third party questionnaires. This helps them understand what security measures have been imlemented. Interestingly, many of these questions align to ISO 27001:2013 and a large number of organisations have decided to follow this route. As a Software as a Service Company (SAAS), acting as a processor for numerous controllers, vague statements such as ‘we have put in place appropriate security measures’ do not help to determine how robust these measures are. The MOD, to secure its supply chain, has mandated that Cyber Essential or Cyber Essentials Plus are required as a minimum standard, which also applies to other sensitive Government contracts. If you want to work with the MOD you need to have these security measures in place as a minimum, and be able to demonstrate it. 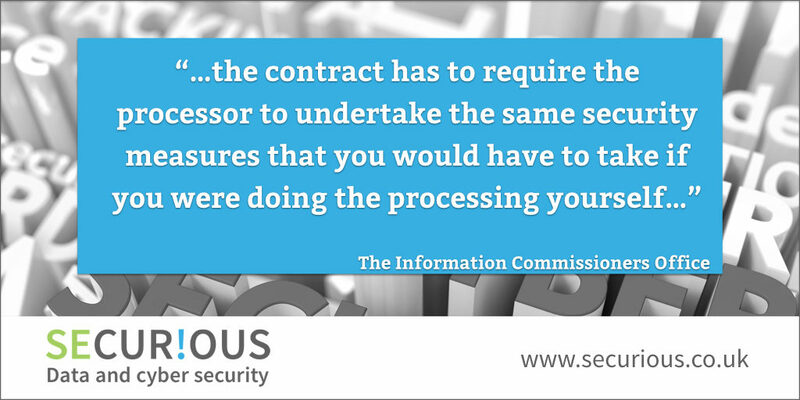 A data processor that “provides sufficient guarantees about its security measures” and details this on their website may have a higher chance of being selected from those that don’t, and this helps to raise their profile as a trustworthy supplier. Cyber security compliance is increasingly becoming a strong marketing tool in our digital age as the new General Data Protection Regulations shape how we seek out new data processors.